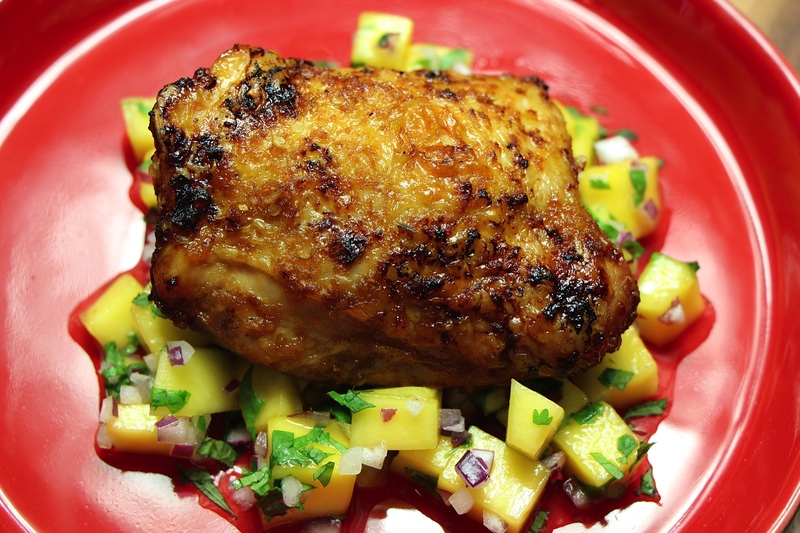 the salsa really compliment the marinade! Pairs perfectly with rice and a nice chopped salad. combine all of the ingredients for the chicken (except for the chicken) and blend until smooth. Place the chicken in non-reactive dish, pouring the marinade over and turning to coat. Let sit for 10-15 minutes. If you have the time, the chicken can be marinated overnight, covered. Remove the chicken from the marinade, shake off excess marinade and place on grill racks that have been coated with oil or spray. Give the chicken a quick baste with the marinade and discard the rest of the marinade. Grill the chicken for about 7-8 minutes and flip, cooking for another 7- 8 minutes or until the chicken has reached an internal temperature of 165. Chicken thighs are pretty hard to overcook so don’t worry if the thighs are on the grill longer than not! *Please note that the skin can be removed from the thighs for a healthier version of this dish. Just remove the skin before marinating! adjust seasoning with the rice wine vinegar if needed. Serve with the chicken.